For today's (late) Thursday Tips post I wanted to talk about using hyperfocal distance. Hyper what now? Setting hyperfocal distance on your lens is a great technique to know if you are shooting landscapes or really anything with a relatively wide lens (50mm or shorter). So what is hyperfocal distance? Put most simply, for a given focal length and aperture combination, it is the focus point that gives you the most depth of field. Basically when you set your focus point at the hyperfocal distance for a particular focal length/aperture combination, everything from half that distance to infinity will fall within the range of acceptable focus in your image. So, how do we calculate hyperfocal distance? The hyperfocal distance (in mm) is calculated by squaring the focal length of the lens, then dividing by f-number times the circle of confusion (see below), then adding the focal length of the lens. The circle of confusion is different for different camera models. The circle of confusion values for many digital camera models are available on the internet. There are also equations you can use to calculate the near and far distances in acceptable focus (whether you are using hyperfocal distance or not). However, we are in the new millennium; you don't have to pull your slide rule out of your pocket-protector and madly work these equations in the field; not surprisingly, there's an app for that. I've been using the Depth of Field Calculator available from Essence Computing on my iPhone which is only $0.99 in the App Store. It is a great little application, that I find very easy to use. All you have to do is plug in your camera type once, then each time you use it plug in your aperture, focal length, and distance to subject. It will calculate the depth of field for that particular combination (including a useful graphical depiction) and also give you the hyperfocal distance for that particular lens/aperture combination. For us foolish Americans, it will also accept and give all the distance measurements in feet, making your life easier. Another popular app ($1.99) available for iPhone, Android, and Desktops is DOFMaster available from Viewpoint Photography. Note, it is more difficult to accurately use hyperfocal distance and the associated calculations if you have a cheaper lens that does not include a distance scale for manual focusing. You can still either estimate distance, or use a tape measure, or use a rangefinder, but it adds some complexity and room for error to the process. It is recommended in this case that you stop down one f-stop from the aperture you used to calculate the hyperfocal distance to give yourself some leeway. When in doubt of your estimating abilities, it is better to focus a little farther beyond what you think is the proper distance. 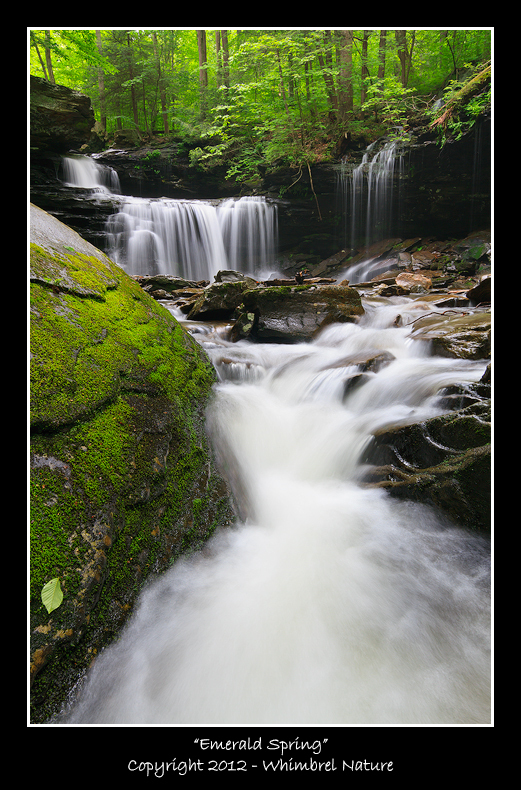 Both of the images in this post, taken at Ricketts Glen State Park in Pennsylvania as well as the image of Ganoga Glen in my previous post, were taken using the hyperfocal distance method. In the case of the picture of Oneida Falls ("Fog And Flow") above, I plugged in 11mm at f/14 into my Depth Of Field Calculator app on my iPhone (I was trying to open up my aperture as much as possible to get a shutter speed that allowed some definition in the flow of water) and got a hyperfocal distance setting of 1.49 feet. Meaning that everything from about 0.75 feet to infinity would be in reasonable focus if I set the focus of my lens at just about 1.5 feet. I did that and then shot away without worrying about what was or wasn't in focus on LiveView or having to use the DOF preview button under the dim conditions. I could even change my composition without changing focus. As long as any foreground objects were at least 0.75 feet from the front of the lens, I knew I was okay. My technique for "Emerald Spring", an image of R.B. 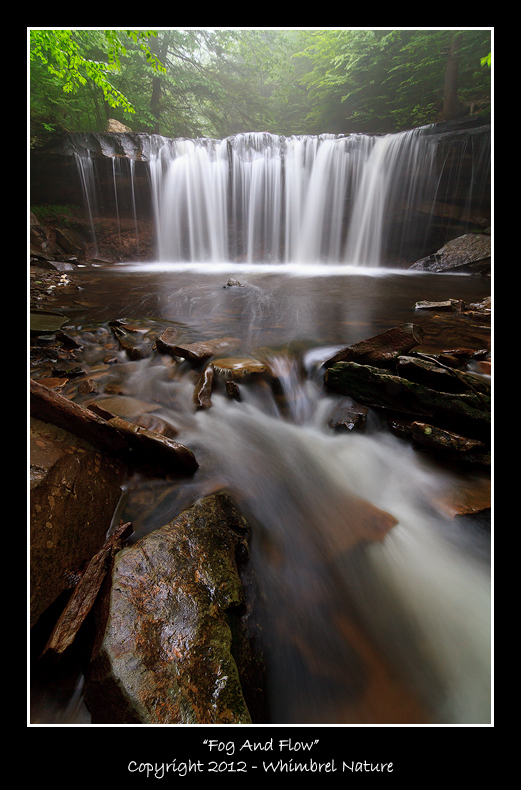 Ricketts Falls in Glen Leigh, was similar, except in this case I had the lens zoomed out to 16mm, so my calculated hyperfocal distance was 3.16 feet. By setting my lens to focus at just a hair over 3 feet, I knew that everything from about 1.58 feet in front of the lens to infinity would be in acceptable focus. Being precariously balanced on slippery rocks and logs in a vigorous rapid that was almost over my hip waders, it was nice to be able to just set my focus ring, forget it, and "focus" on other things. Hyperfocal distance and depth of field calculations are pretty easy techniques to master (particularly with the apps now available) and they will lead to great improvements in your consistency and ease of work when shooting with wide lenses. So brush up, grab a compatible app, and get out there and shoot! This is an awesomely useful and accessible post about a topic that used to drive so many folks crazy! Kudos Elijah! I learned something new today, Elijah. Thank you! Your photographs are superb, as always!